My day started like any other day. It was a beautiful day, much different than the previous 4 days of torrential rain. As I was standing at the front of the restaurant waiting to seat guests, I noticed four very tall gentlemen approaching. I greeted them, they asked for a table. From this point onwards, my whole day changed, and even now, I cannot quite believe it. I’m 24 years old, and for as long as I can remember, I have loved Titans Football. I’ve lived in the UK all my life and only visited the United States once a year. Living in the UK, football isn’t a very big thing. It’s gaining a big reputation, but it will never be as big as soccer. At work, I am the only person who knows anything to do with football. So for my day to take the path it took, well it’s almost unbelievable. It was. My legs were like jelly and my heart was going so fast, it would have given Usain Bolt a run for his money (no pun intended). As Ben and his companions were taking their seats, I couldn’t help but mention that he looked so familiar. His response? “I get that a lot”. Right there I knew it was him. “You wouldn’t happen to live in Pittsburgh would you?”, I asked. “Yeah, we all do”, replied Ben. He extended his hand and I shook it. It completely engulfed my hand, but I didn’t care. I was so starstruck, you wouldn’t believe. “I’m Ben, nice to meet you”, he continued. Now, I’m not 100% sure exactly what I said next but my mind said I know exactly who you are”. He must have been a little surprised that I recognized him straight away. I would imagine he thought he would not encounter anyone who recognizes him in Scotland. For the rest of the afternoon, I was beside myself. I couldn’t believe it at all. 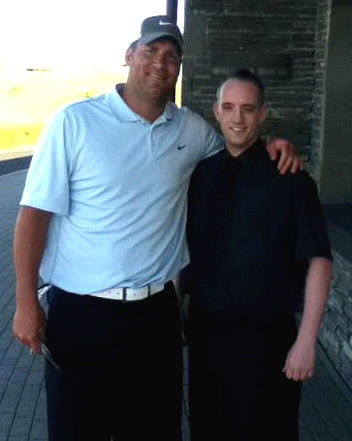 I met him after his round of golf and asked how it went and congratulated him on graduating a month prior. I don’t know what I was expecting, but both he and his group were very friendly, and surprisingly easy to talk to. Meeting Ben really made my day worth remembering. I don’t know how many times my colleagues had been told that he is a 2-time Super Bowl champion and 2-time Pro Bowler. I must have driven them crazy. Put it this way: If they didn’t know who Ben Roethlisberger is, they know a lot more about Ben Roethlisberger now than they used to. Thank you for sharing your story, Chris! You can see more fan photos and stories here.